It's been a funny old weekend. Mr B and Emi have been off on a father-and-son's camping trip with their chums from school, leaving me and the Wonder Dog back at the ranch on our own. Weird! It's been a bit weird, if I'm honest. I've not had a weekend alone in over a dozen years, and it's taken a bit of adjusting to. I thought it would be great. I could do exactly as I chose, but it's felt strange having the house so empty and quiet. The Wonder Dog has spent the time prowling around, from room to room, looking for people. Still it's been a great weekend for the roses. Neither Mr B nor Emi quite understand my love of roses, and tend to tease me about my simple enthusiasm for them. So, with the coast clear, I've been able to swoon from rose bush to rose bush with no one around to notice me burying my nose in their petals and inhaling their wonderful scent. I have two of these beauties (below) on either side of my front gate, and they are simply exquisite. 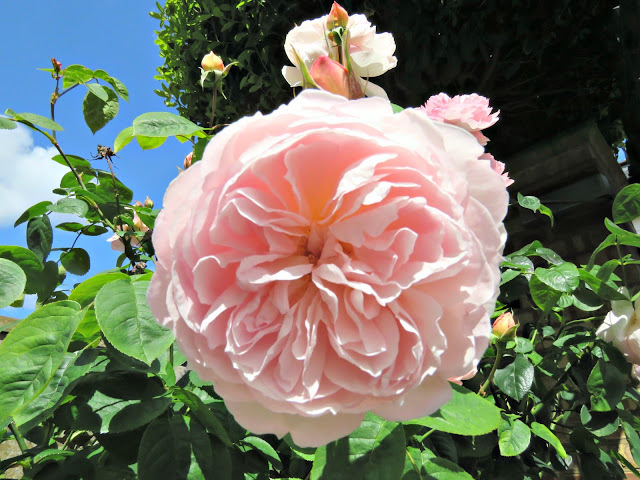 This is David Austin's Sweet Hermione, and it really is a champion rose. Like many of the modern cultivars it's robust and disease-resistant. It grows beautifully with very little assistance from me. And come early June it bursts into the most amazing, fragrant display of old rose charm. 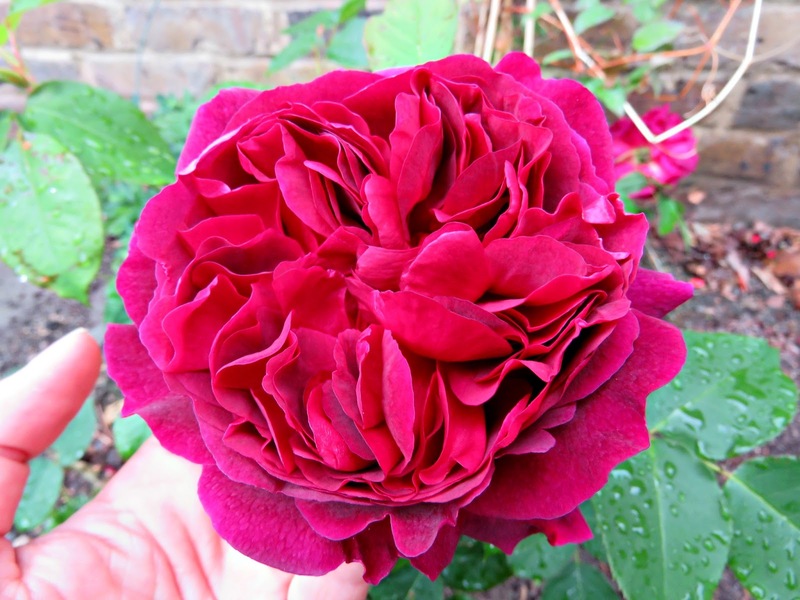 This rose is exactly what a rose should be: big and voluptuous and divinely fragrant. This is what I would advise any June bride to put in her bouquet. It is an epic rose! Somehow its fragrance is at its best on a warm sunny day. 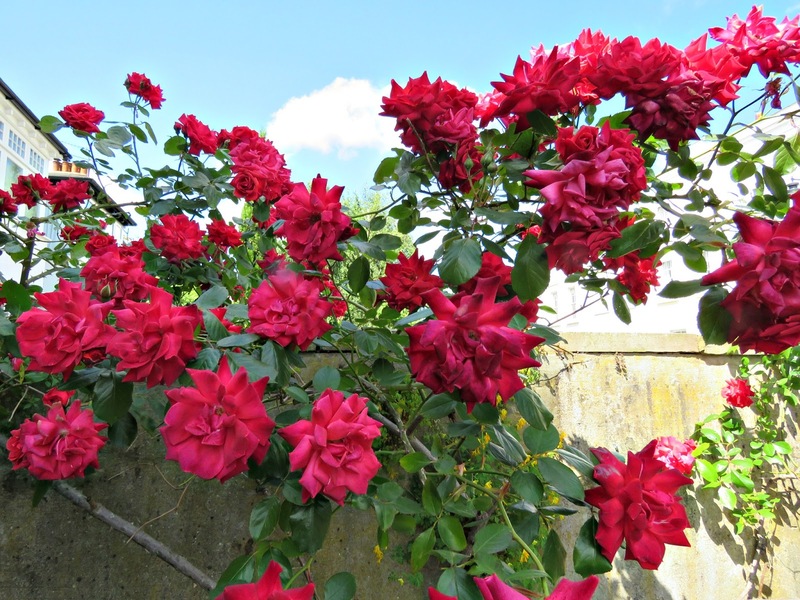 My rose bushes are hidden from the street by a high garden wall, but people still stop going past my gates, and pause to sniff the scent that's wafts out on the breeze. They really are that fragrant! I've also got a lovely climbing rose on my side wall at the front. It's a real trooper, always putting on a good display with a spot or repeat flowering that goes on all summer after its first exuberance. But, sadly, it doesn't have any scent, which leaves me feeling just a little bit short-changed. 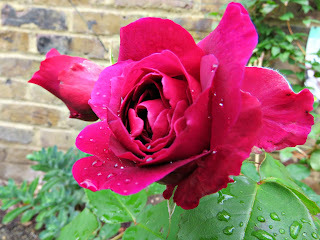 And now, out back, my much-anticipated Munstead Wood (also by David Austin) is blooming. I've got it planted right beside my back door, and on warm, sunny days its wonderful smell wafts in and makes my heart sing. 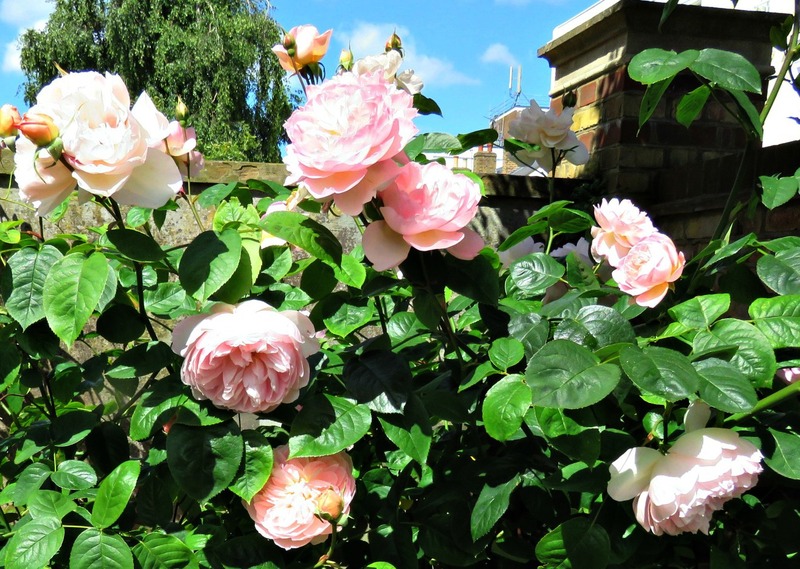 For me, this rose is the very essence of summer in England. It really is the most exquisite plant. 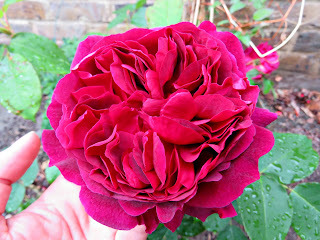 The fragrance is fabulous, and those rich, dark velvet petals are so very beautiful. 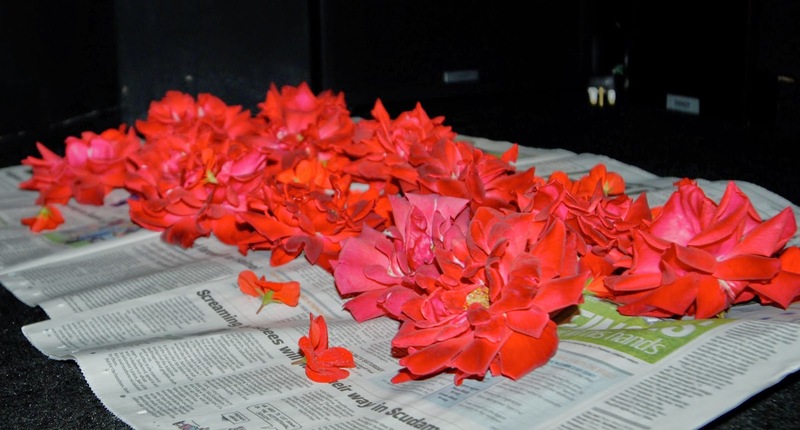 As I'd hoped, it will make the most perfect potpourri rose. The only thing is that I've got to sacrifice a few of those wonderful blossoms for the cause, which I'm just not ready to do yet. Maybe next year ... . 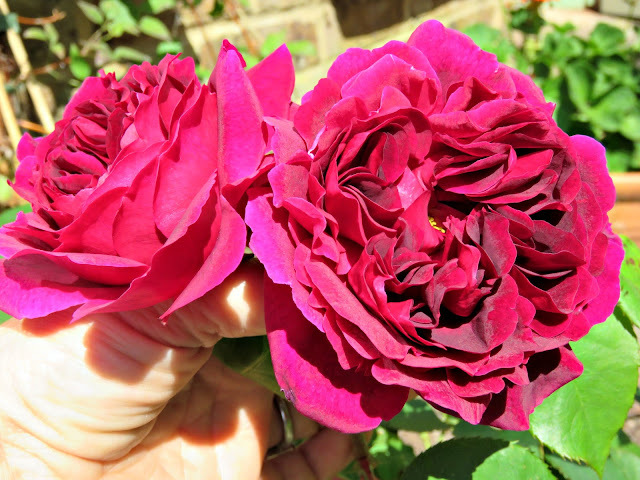 If you'd like to make potpourri from your own roses now is the prefect time to harvest them. Be sure and do it on a nice dry day. I've written about how to go about it here: Potpourri 1 and, then I've followed up with a second instalment here: Potpourri 2. And if you're out and about this week you might like to stop by at the Queen's House in Greenwich, where they have the most amazing rose garden. I popped by last September when the roses were still going strong and it was sublime. 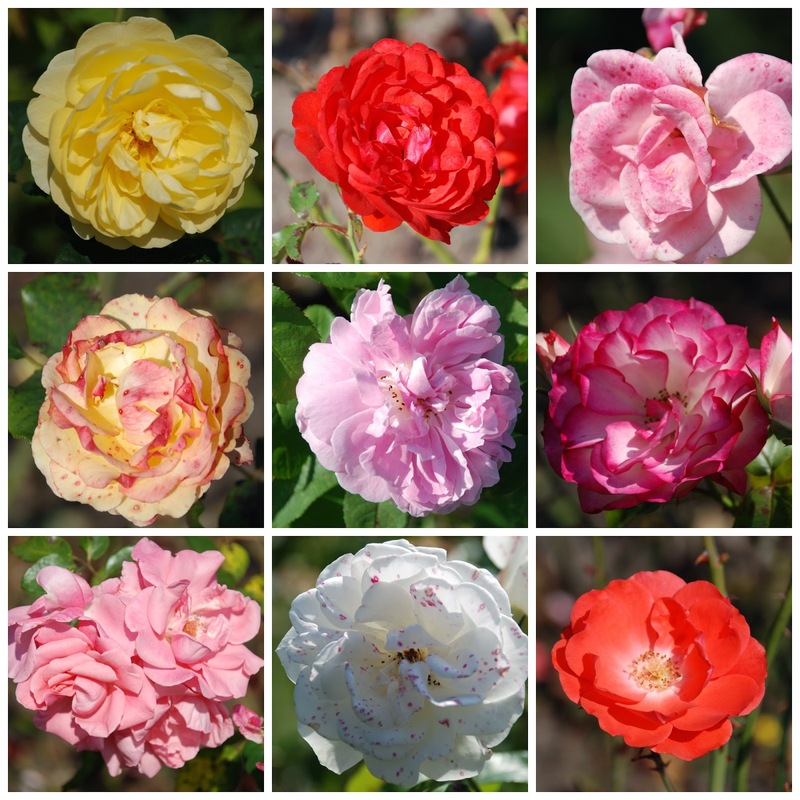 Your roses are just stunning! Thank you so much for coming by my blog and commenting. I am way behind in catching up with people, and apologize for taking so long! You commented on the church post, and told me about Elizabeth Ann Seton, who unfortunately I did not know about. Her name seemed familiar to me, but I didn't look her up before I did the post> Thanks so much for filling me in! Have a lovely weekend! Happy weekend to you too - we had a blast with out little nephew and now the house seems a bit empty.